How this adventure got started. The Middlebury Campus has published an interview with me about the R/V David Folger. Check it out! NSF has approved Dave Weed as our marine inspector. Dave was the best match out of several inspectors we interviewed, so we’re very pleased to have him on board! The contract for Richard Furbush, who will captain the new vessel, was approved and signed back in October; he’ll be working with Dave during the construction process. The aluminum for the vessel has also been ordered. It will arrive at AAM in plenty of time to meet their January schedule. Tom and I will be teaching at Middlebury’s California campus — the Monterey Institute for International Studies — this Winter Term. Looks like all the hatches are battened for now — peace on earth & goodwill to all! I’ll see you in the New Year. NSF has approved the College’s contract with AAM. Now the real work begins! 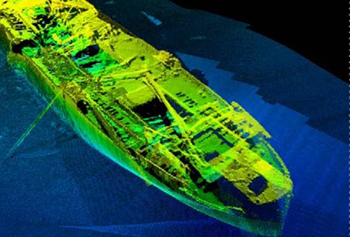 Sarah Ray and I have co-written a press release about the new research vessel — read all about it! 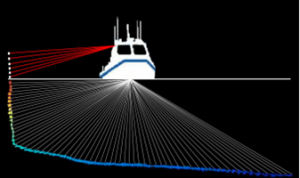 It’s official: All American Marine will build Middlebury’s new research vessel. The vessel will be twin hulled — a catamaran — and 45 feet long. 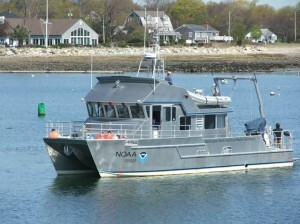 Middlebury’s research vessel will be very similar its sister ship, the R/V AUK (pictured here), which AAM built for the National Oceanic and Atmospheric Administration (NOAA). Of the eight ship builders who sent us proposals in 2008, AAM was the best: their design and construction capabilities are superior, and the level of detail they provided convinced us that they are the right choice. The National Science Foundation hereby awards a grant of $1,731,377 to Middlebury College for support of the project described in the proposal referenced above as modified by revised budget dated July 13, 2010. This project, entitled “Upgrading Middlebury College’s Floating Laboratory: A State-of-the-Art Research Vessel,” is under the direction of Patricia L. Manley, James R. Ralph, Robert G. Cluss, Thomas O. Manley. This award is effective August 1, 2010 and expires July 31, 2013. This award is funded under the American Recovery and Reinvestment Act of 2009 (ARRA) (Public Law 111-5).